To stand at Nowton church, or the almshouses where the friendly keyholder is, you would not think that we could be so close to Bury St Edmunds. Here, in rolling west Suffolk, woods and copses hide the next parish in any direction, creating an intimacy which is not belied by the occasional hazy distant view from a ridge or hilltop. 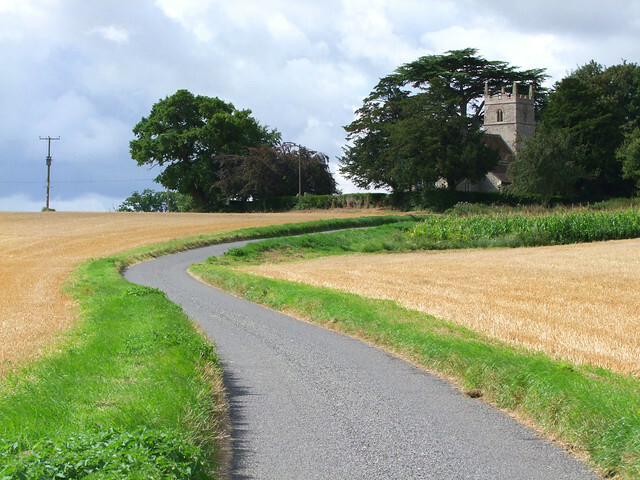 Nowton church sits on one particular hill, a long track leading up from the nearest road into the silence of its tree-shrouded churchyard, an oasis of lush botanical green in the agricultural expanses. A mile or so off in the Bury suburbs is Nowton Country Park, one of the main recreational areas of the town, and the former grounds of Nowton Hall. The Hall was the home of the fabulously wealthy Oakes family, and in 1811 Elizabeth Frances Oakes, wife of Orbell Ray Oakes and Lady of the Manor, died at the age of 42. 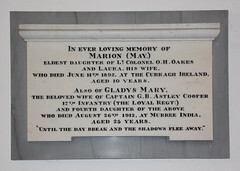 She was buried in Nowton church, which must have been a very plain and ramshackle structure in those Georgian days. However, over the next ten years something extraordinary happened here, as we will see. 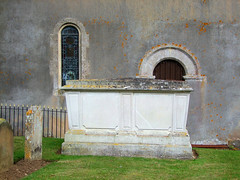 Essentially, the church in which Elizabeth Oakes was buried was a 14th century building with surviving Norman details, before the Victorians went to work on it. Walking around it, the graveyard is a strikingly beautiful adornment, still with an air of the early 19th century, with the kind of trees that Lords of the Manor and Rectors-of-leisure liked to plant in those days, including a glorious cedar. 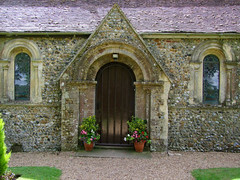 Stepping inside, this is a pleasant, shipshape little church. All around are memorials to the Oakes family in the 19th and 20th Centuries, but it probably won't be them that catches your eye, because Nowton is home to one of the largest and best collection of continental glass in England. Not far from Nowton is Rushbrooke, which in the early 19th Century was the home of the eccentric Colonel Rushbrooke, an avid antiquarian and carpenter who I am afraid was not above the odd spot of forgery. He refurnished Rushbrooke church in the manner of the Cambridge college chapel of his youth, giving it a Henry VIII royal arms into the bargain. Items that he collected can be found in several churches in the eastern counties, for Colonel Rushbrooke spent many happy months in the first decade of the 19th century trawling around the Low Countries and buying up wooden panels and painted glass from monasteries. Many of these monasteries had been closed and ruined in the aftermath of the French Revolution and the following Napoleonic Wars, and their treasures were easily acquired for the right price. 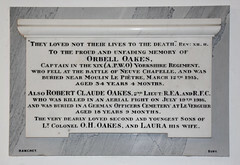 At this time, Orbell Ray Oakes was struggling with a way to make Nowton church into a more fitting and beautiful last resting place for his wife. His solution was to purchase perhaps as many as eighty continental panels from Rushbrooke. 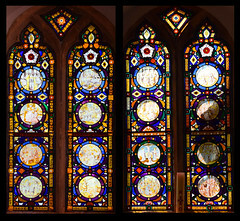 They were installed between about 1816 and 1820 by the Norwich stained glass artist Samuel Yarington, who was an expert in these matters, working with the Norwich antiquities dealer Christopher Hampp to supply and install continental glass, mostly depicting scriptural and allegorical subjects, to English churches, mainly in the Norwich area. In those days before the great revival of church art later in the century, most English churches were very plain, especially in puritan East Anglia, and in any case coloured glass of English manufacture was not easily come by. The installation of panels of continental glass would be an easy solution, and even a few panels would be an adornment to a simple church. The Nowton scheme, of course, goes much further than this. The panels are to be found in every window except the west window. The panels in the east window are set in nine groups of five, the larger panel in the centre of each group and four smaller panels orbiting around it in a sea of Yarington's patterned glass. 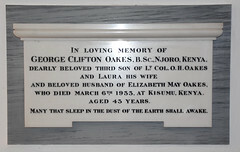 There is no obvious sequential order or theological structure, and so it must be assumed that Oakes' intention was purely decorative, to make beautiful his wife's last resting place. 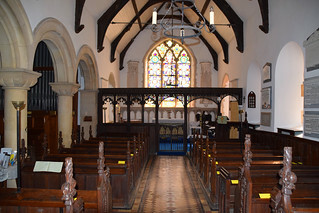 The panels were reordered on two occasions later in the century as Nowton church was restored and extended, but the original configuration of the east window in particular was not altered much. There are slightly odd panels depicting knights on brasses by John Sell Cotman set at the base of someof the aisle windows. 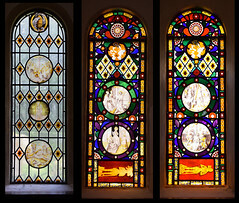 When the glass was restored in 1970, some panels from the demolished Dagnams Hall in Essex were added at the bottom of the east window to replace glass of Yarington's that had perished. 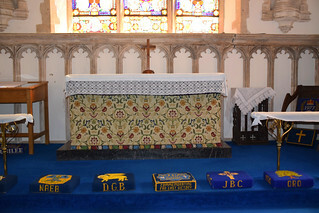 Click on the images below to go to photographs of individual glass panels in that part of Nowton church. 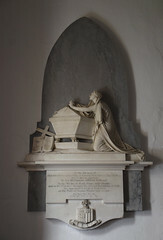 At the west end of the south aisle is the elegant memorial to Elizabeth Oakes by John Bacon Jr. 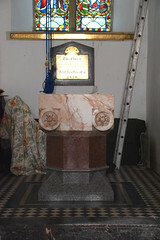 It shows her praying against an angled tombchest on the other side of which are a cross and an open book reading Thy Will Be Done. 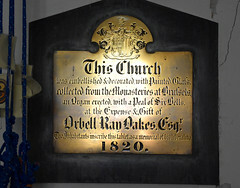 Under the tower, a brass plaque tells us that this church was embellished & decorated with painted glass collected from the Monasteries at Brussels, an Organ erected with a Peal of Six Bells, at the Expense & Gift of Orbell Ray Oakes Esq. 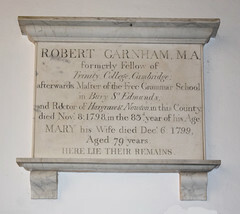 The inhabitants inscribe this tablet as a memorial of his liberality, 1820. 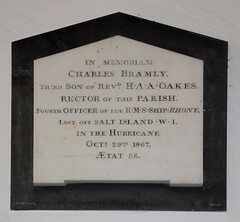 Orbell Ray Oakes died in 1837 as the Victorian era began, and his son Henry James Oakes, the new Lord of the Manor, bankrolled a considerable restoration of the church under the architect Anthony Salvin. The construction of a neo-Norman north aisle necessitated the moving of some of the panels, and possibly the acquisition of some more. 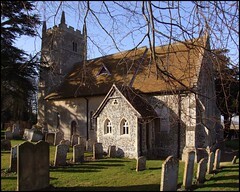 The nave and chancel were essentially rebuilt and the building was reroofed. 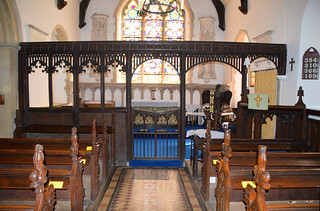 The elegant remains of the medieval screen were retained, and all this must have been a very shipshape little building by the end of the 1870s. The Oakes family continued to live in the parish at Nowton Court, built in the 1830s. In the 20th Century, Nowton Park was acquired by St Edmundsbury District Council. The last of the Oakes family is still alive today, in her nineties, but after her the dynasty will be no more. 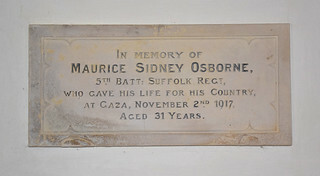 Around the walls of the church, memorials recall members of the Oakes family, some dying out in the Empire, some of the younger ones falling on the battlefields of France in the First World War. But having said all this, I do think this building escapes being merely a mausoleum to the Oakes family. 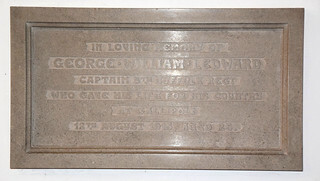 Perhaps it is the simplicity of their memorials, or the sense of life in the building, despite its remoteness. Even so, the overwhelming feeling is of the century that rebuilt it and adorned it, which is just as it should be.